Soldiers with the U.S. Army's 6-4 Cavalry take up a hilltop position during a patrol in eastern Afghanistan. Will the U.S. Stick By Karzai in Afghanistan? Can Robert Gates Tame the Pentagon? 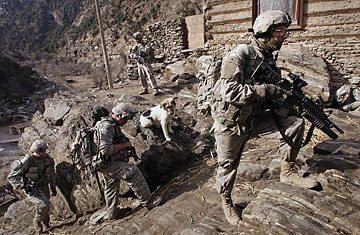 Afghanistan became President Obama's war on Tuesday, when he ordered two more U.S. combat brigades into the fight. He will send 17,000 combat troops to join the 36,000-strong U.S. force already in the theater. The fact that the units now ordered to Afghanistan had originally been slated for Iraq underscores the new Administration's shift in priorities. If Army General David McKiernan, the U.S. commander in Afghanistan, gets his way, the total increase over the coming year will be 30,000. McKiernan has said he needs to beef up U.S. forces in Afghanistan to roll back a growing Taliban insurgency, especially before the presidential election currently slated for August. Indeed, U.S. officials say they have only 40% of the American officers needed to train the Afghan army to take over security duties at some point in the future But sending any additional troops to Afghanistan would require reducing U.S. troop levels in Iraq, and Obama has ordered a review of U.S. strategy in Afghanistan before committing to further reinforcements. Defense Secretary Robert Gates explained last week that the units ordered to Afghanistan on Tuesday had to be given their marching orders before the Administration's strategy review could be completed because of the pressing need for reinforcements. With the Taliban growing in confidence and feeling the wind at its back, the bad news out of Afghanistan just keeps getting worse for the U.S. NATO commanders have long expressed frustration at the failure of the Pakistani military to prevent Taliban and al-Qaeda fighters maintaining sanctuaries in Pakistan from which they can launch attacks inside Afghanistan. But Pakistan's announcement on Monday of a peace agreement to accommodate the domestic Taliban insurgency in the Swat Valley suggests that an all-out war against militants on their soil is not what Pakistan's generals have in mind. And the supply lines that funnel food, fuel and war materiel to U.S. forces in Afghanistan, already imperiled by militant attacks in Pakistan, may face a further setback this week when the parliament in Kyrgyzstan votes on whether or not to kick the U.S. out of the Manas airbase, which has played a key role in air support in Afghanistan. The U.N. just announced that 2,118 civilians died in fighting in Afghanistan in 2008, a 40% hike as the war grows ever more bloody. And, last week, the Taliban "welcomed" U.S. envoy Richard Holbrooke to Kabul by launching an audacious terror attack on three government buildings in the capital, leaving 26 people dead. Having watched rival armies fight their way back and forth across the country for the past 30 years since the Soviets invaded, Afghans have become adept at accommodating themselves with the likely winner at any given moment. Right now, the trends are not moving in Washington's favor, and that fact is recognized by the Afghan citizenry. "There's been a major shift towards acceptance of the Taliban," military scholar Anthony Cordesman told a congressional panel last week. He noted that polling in Afghanistan shows "the number of people who feel the United States has performed well in Afghanistan has been cut in half in the last three years," from 68% in 2005 to 32% now. Hardly an auspicious moment, then, for Obama to put his stamp on the U.S.-led war in Afghanistan, but a commander-in-chief doesn't always have the luxury of choice. As a senator, Obama had criticized the "surge" of nearly 30,000 additional U.S. troops into Iraq two years ago. Now, as commander in chief, he has begun ordering what may turn out to be a similar increase into Afghanistan. Of course, he had maintained on the campaign trail that Afghanistan, not Iraq, was the "right" place to wage war on terror, but his strategy review reflects the fact that many have begun to question the goals and focus of the U.S. mission there. Obama began his terse statement Tuesday by acknowledging that "there is no more solemn duty as President than the decision to deploy our armed forces into harm's way." He has been personally writing letters to the families of each U.S. soldier killed in Afghanistan and Iraq, hand signing them "Barack." Such letters no doubt will become more difficult to write in the months ahead, when the casualties begin to include some of those he ordered into combat. Watch a video about skateboarding in Afghanistan.